The Silver package is our standard and most popular package. It comprises of a sound system and five lighting effects washing colour around the venue. Dazzling effects are created using the intelligent lights making an outstanding display. This package includes - A High quality sound system with wireless Microphone. 4 intelligent lights on white or black plinths. 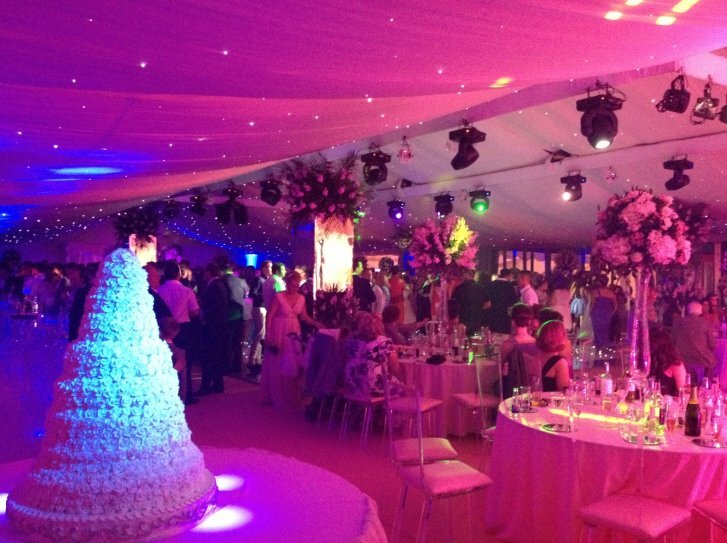 Add a sparkle to your venue or marquee with one of our dance floors. 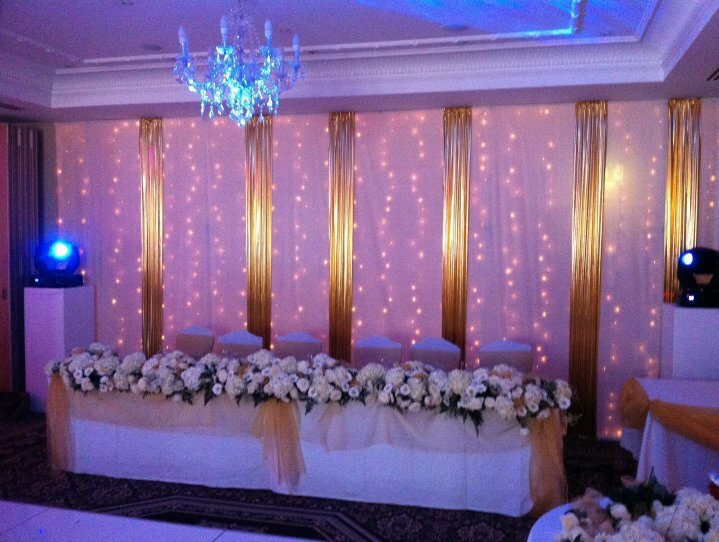 The Gold package is a very popular package with the majority of our venues. 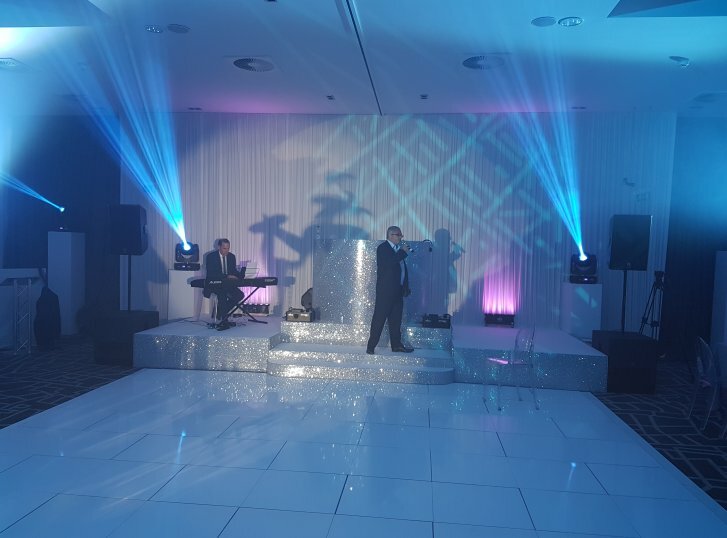 This package includes a standard white dancefloor (16ft x 16ft) It comprises of a sound system and 6 intelligent lights on white plinths washing colour all around the venue and dance floor. This package includes - A High quality sound system with wireless Microphone, 6 intelligent lights on white plinths. 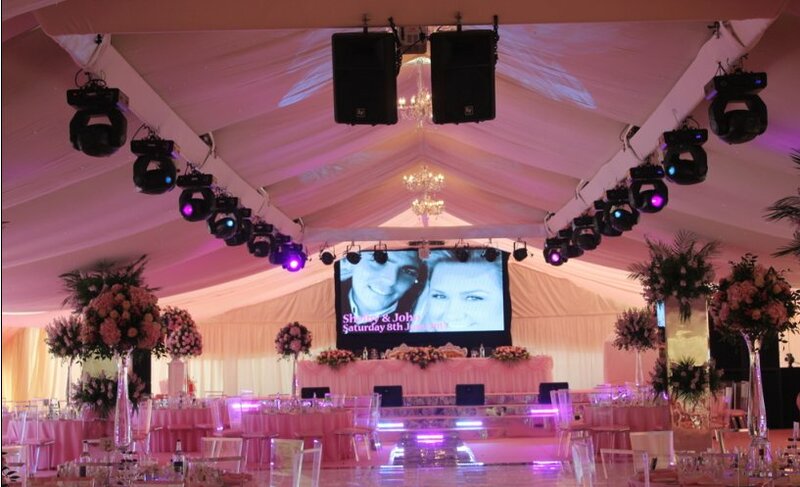 Add a sparkle to your venue or marquee with one of our LED Dance floors (16ft x 16ft). Our Platinum package is a very impressive bundle. 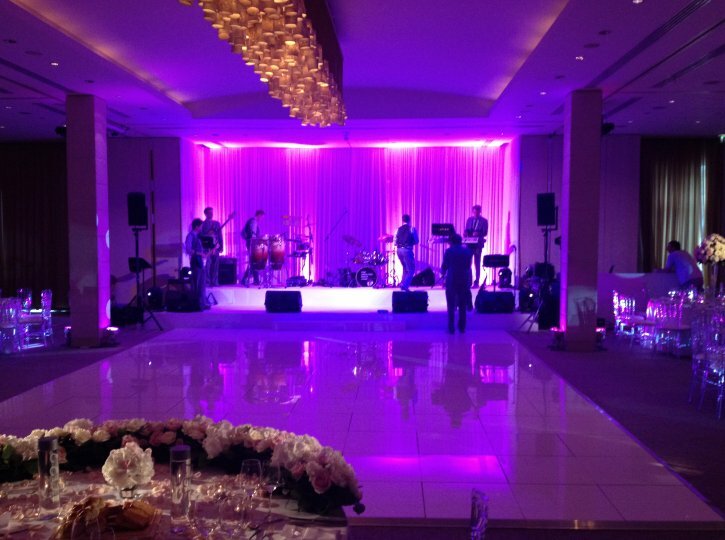 this package includes a standard white dancefloor (20ft x 20ft), comprises of a 4.5k watt sound system and eight intelligent lights washing colour around your selected venue and dance floor. 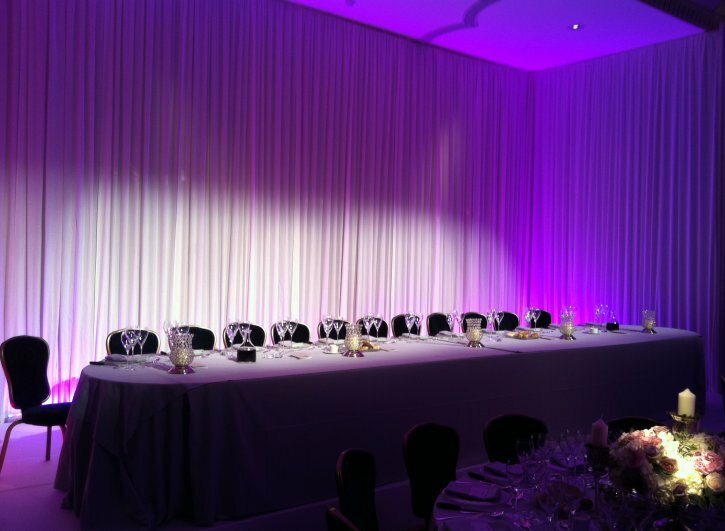 Additionally, eight intelligent lights are placed on white plinths to make an outstanding display. 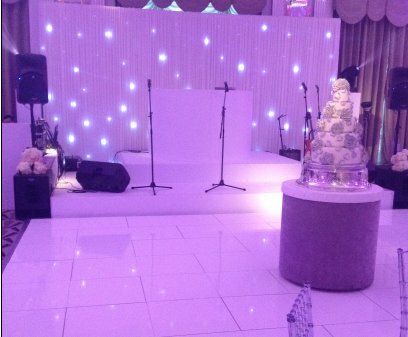 This package includes a sound system with wireless Microphone, Pure white dance floor, 8 intelligent lights placed on white plinths. A 20ft x 20ft pure white floor is already included in this package but we do offer the option to upgrade to an LED floor. 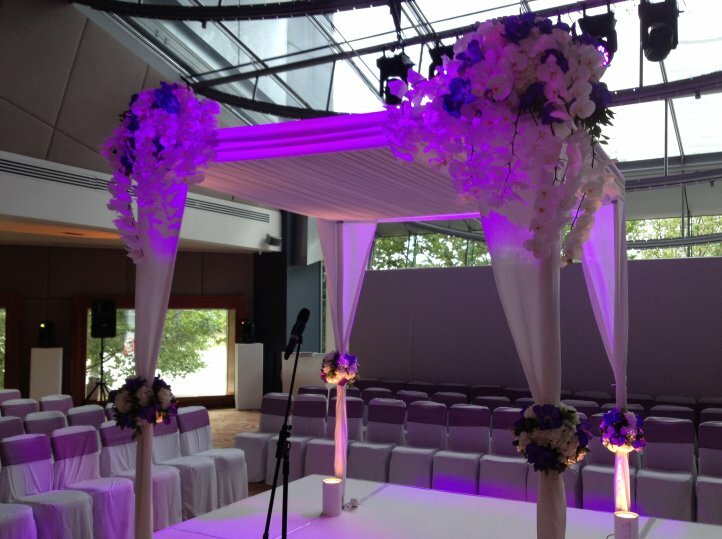 Listed below are our most popular wedding items ordered with Corporate Events UK. These items are priced as "add-ons" to any of the above packages. Imagine hits played from the 60's through to today's chart and videos displayed on our big screens. Perfect for giving your wedding that "Wow" factor. We can also run a live camera feed of the dance floor through the screens to spread the excitement from your first dance and your guests to add extra atmosphere. A choice of photographs from the day or personal messages can also be displayed during your special day. The feeling of seeing the original Music Video or the actual Band performing their songs is very difficult to explain, but seeing is certainly believing. A great wedding idea, the wedding diary room. A 3m x 3m white room with professional video camera and operator for guests to leave personal messages. The collection is then made into a dvd for you to keep. Gives you the option of a lasting memory with a bit more life than a photo. 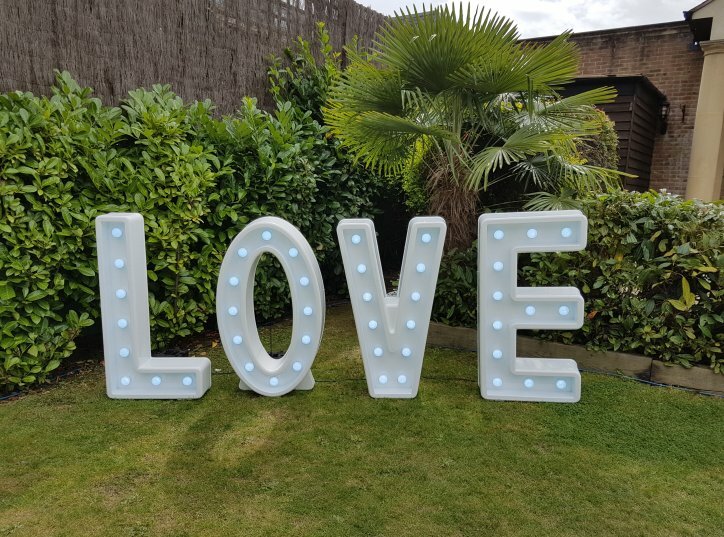 Our brand new and ultra-modern led love letters add that wow factor to your big day. They can be set to white or any colour of your choice, or even fading from colour to colour!! Not only do we have love letters we also have MR & MRS and love hearts also available. All of our wedding packages can be added to, please see the below add-ons this allows you to tailor any of the above packages to suit your requirements for your big day. Please click here to view the many colours that we can offer. Tables and chairs with table cloth, chair covers and sashes - For up to 80 guests. Tables with table cloth but chairs without chair covers and sashes - For up to 80 guests. Pinch pleating any colour up to 4m high. 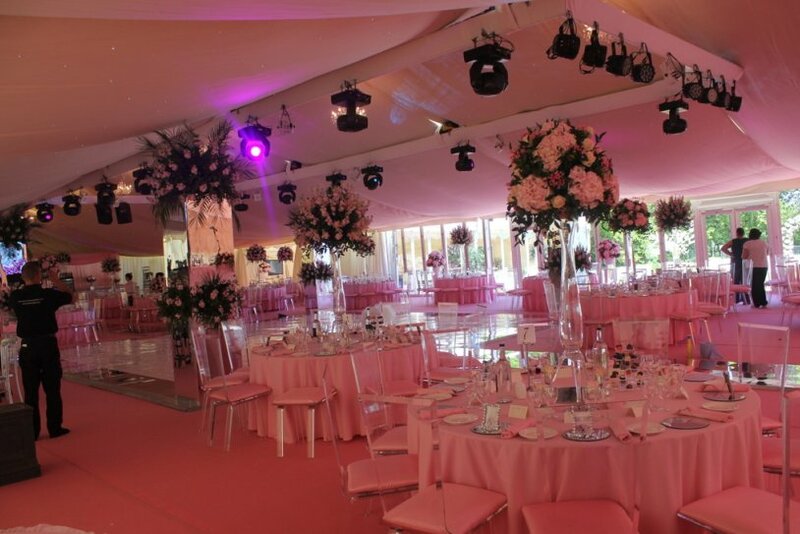 Corporate Events UK have a wide range of marquees of all sizes, these are idea for any wedding reception. 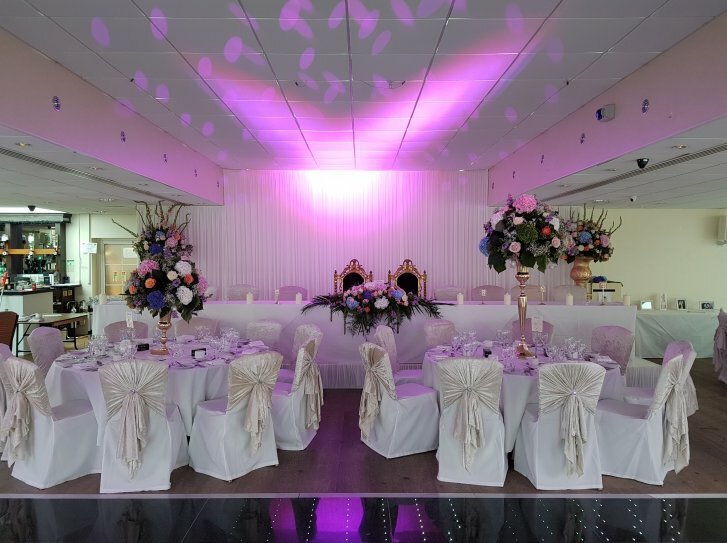 Corporate Events UK has done all the hard work for you finding the perfect venue for you to have your special day, we have personally looked into the venues on your behalf.